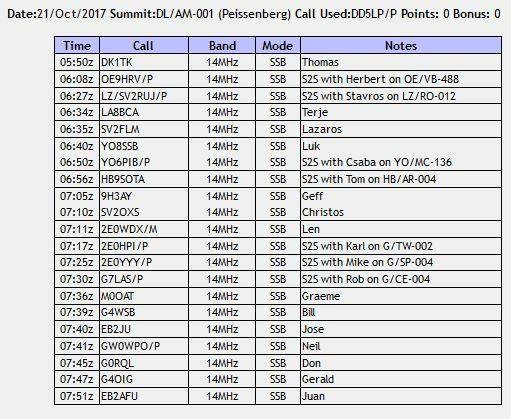 DD5LP/P – October 20th 2018 – DL/AM-001 Peissenberg – EU-VK S2S event or “Mixing SOTA with JOTA”. This was the date chosen for the annual EU-VK (actually UK+EU – VK/ZL/JA) S2S event where we would try to get Summit-to-Summit contacts between the two sides of the Earth. With conditions as they were, we were more likely to be happy with a contact with a Chaser “Down Under” if even that was possible. Several tests and contacts with Chasers in VK & ZL had been made over the previous weeks but more on 40 metres than the usual 20 metres band. In any case About 45 activators were expected to head out and if nothing else some S2S contacts should be possible within the regions if not between them – time would tell. I had planned to head over to Steig a 2 point summit which I have not activated yet this year but twisting my ankle while taking the dog on her walk through the local fields mid-week put paid to that as it’s a long walk up a rough track to Steig. Instead I decided to take the closer option of Peissenberg with its short walk from the car park to the summit by the church. I would not get any activation points for this action as this would be my third visit to the summit this year. Hopefully I’d come away with a few summit-to-summit points though. Band conditions on the days before the event had improved so hope was high of some good contacts. I also had a new antenna to test – a Komunica HF-PRO-2 which is a large vertical whip with an adjustable loading coil at the bottom which is designed to be mounted on a car (either a mag. mount or a boot-lip or similar mount). In my case I would be using it on a small Hama photo-tripod that I have added an SO-239, coax and 4 short non-resonant radial wires to. I tested this configuration just in the garden with the antenna analyser and receiving with the rig but this activation would be its first real test. I would of course still be taking my old faithful linked dipole and 6 metre mast and just in case… my Aerial-51 OCF antenna as well (a choice that paid dividends as it turned out). I knew the route down to Peissenberg very well and so to be operational by 8:30 local time (0630 UTC), I set my alarm for 6 am with a planned departure time of 7 am. All the gear was packed and ready to go. Although I know the route very well, what I hadn’t reckoned on when I woke up was a pe-souper fog with visibility down to about 10 metres. As I set off from home, I decided that if it didn’t get any better, I would need to stop and turn around and give up the activation. Luckily as I drove further I found that on the roads between the villages the visibility was a lot better but driving through the villages with their limited street lighting and in some other cases to bright street lighting, the drive down was difficult to say the least. Eventually I reached the summit car park and it had only taken me about 15 minutes more than normal. I was glad to have arrived safely. as I got out of the car the damp cold hit me and I was so happy that I had decided to take my thick winter anorak instead of the lighter jacket! As I got to the usual set-up point and looked out across the valley all I could see was white. as if the summit was in the middle of a cloud – but this was definitely fog. I decided to set up the new antenna on the tripod first and while I had planned a spot for it to stand on the ground, I decided to simply set it up on the seat bank that I always activate from. It was at this point that mechanical failure number one occurred – the adjusting bolt that is used to make the top pad that has the SO-239 on it level broke where I had repaired it a few weeks earlier from a similar problem. So for the duration of the activation the antenna would be sloping a little off vertical – but it was up and I adjusted the coil close to the setting I had recorded at home for 20m. As I had planned to test the new Komunica antenna, this would be its “baptism of fire”. I tuned to a clear frequency on 20m, switched on the SWR trace function of the Xiegu X108G and fine tuned the antennas coil setting. Once I was happy I spotted my self on the SOTA Cluster and back came two calls – OE9TKH portable in Austria – which could have been ground wave and we exchanged 5-5 reports and then a surprise a call from RW3XZ in Russia who was a booming 5-9 signal and he gave me a 5-9 report as well. The new antenna was working! For a while there were no more calls but then I saw Mike 2E0YYY/P had spotted as being on 40m so I swapped antenna cables and worked Mike. Unfortunately the contact with Mike showed another problem on the linked dipole. On my last activation, I had a bad connection to the rig from the antenna – I checked the BNC plug on the antenna cable and could not re-produce the break so I replaced the BNC to PL-259 adapter but with the new (known good) adapter, I once again had problems with the connection. This got so bad after just one contact that I declared this as mechanical failure number three and took down and packed away the linked dipole antenna. Do you remember I said I had also packed my Aerial-51 off centre fed antenna “Just in case” – well this was the case, so my wire horizontal antenna now became the Aerial-51 404-UL antenna. All of this repair and replacement work took time and I was losing the chance to work other summits! As the Aerial-51 antenna works on 40m & 20m without any switching, I then tuned around 20m and 40m to see what I could hear. what I could hear was a loud background noise that got louder if I moved my hand towards the battery box that has a voltage regulator to drop the up to 16.5v from the 4S LIPO batteries to 13.5v for the rig. Electrical failure number one – the regulator is creating RF noise – this will also have to be looked into. I then heard a station on 14.298MHz with a loud signal, so I decided this would be a good contact to test that the Aerial-51 OCF antenna was working – plus the call was SU8JOTA, so I thought I might be able to help by speaking with some scouts. Unfortunately there were no scouts there at the time and Yaser was trying to contact other scout stations, so I left him to it, happy that the antenna was working as I got a 5-8 report from him. I thought the “SU” call sign was possibly a special call from Poland or Greece, in fact SU8JOTA was the Scout Centre in Cairo, Egypt. So at least I got one, outside of Europe contact. After a contact with a local chaser who returned to my CQ call on 20 metres, my next contact was another Scout (JOTA) station with the call sign II5BP/J or I-I-Five-Baden-Powell slash JOTA as I referred to it – again no scouts were present or perhaps simply not eager to speak English on the radio? All of this time I was listening for and checking the cluster for any SOTA stations from VK or ZL but without success. My next two stations I worked on 20m using the dipole were Ralf on a summit in Switzerland and Herbert on a summit in Liechtenstein. As time was getting on, I took down the dipole and mast but then decided to put out one last call on the new loaded vertical and I was rewarded with a call from Santiago in north-west Spain on the atlantic coast. Komunica HF-PRO-2 vertical antenna and modified Hama photographic tripod. Aerial-51 Off Centre Fed dipole 404-UL. The number of failures that occurred were a challenge but despite this and terrible radio conditions, I believe the activation was a success with 4 x S2S contacts, 2 JOTA contacts (one into Egypt where I don’t think I’ve had a contact before), a new small portable antenna tested as suitable for difficult to get to, or crowded summits and being able to deal with the weather conditions. The weather was something that a lot of the activators in VK2 & VK3 could not fight against and had to cancel as their summits would have been too dangerous in the heavy storms. I have a lot of repairs to complete before my next activation. November 3rd sees the annual EU-NA S2S event (now renamed to the Transatlantic SOTA S2S event as there are now South American SOTA countries who will take part). At least in that event, it’s afternoon in Europe, not really early morning! DD5LP/P – September 26th 2018 – DL/AM-001 Peissenberg – trying for VK on 40m. For some time now twenty metres has been in the doldrums and not providing contacts into VK/ZL on the morning grey line via Long Path. After hearing some stations on 40m from home during the previous few days Mike 2E0YYY from the UK and I decided to try to get out and see if indeed we could manage contacts into VK on 7MHz from a SOTA summit. All looked good the two days before and we lined up Ernie VK3DET and John VK6NU to be listening for both of us. Unfortunately my normal rig – the X108G was out of service awaiting a replacement CMOS battery for its memory. So this activation would double as a check that the “old gear” still works, I carefully re-packed my SOTA bags with the FT817ND, my vastly modified Ramsey amplifier and (hopefully) all cables and batteries needed to run the old system. As is often the case, the need to be on the summit relatively early meant that the higher scoring summits were out and I had planned to activate Irschenhausen, a one point summit that I have not yet activated in 2018. It’s just over an hours drive away and then 15-20 minutes walk from the parking spot to the summit. Although in the middle of a forest, I have had contacts into VK from this summit in the past. A couple of days before however, I decided, given the chance that the equipment may not work for some reason, the “drive-up” Peissenberg summit would be a better choice even though I have already activated it in 2018 and hence would not get any points for activating it. Peissenberg is also closer and simpler to drive to – although not my closest summit, it is the easiest drive which is about 40-45 minutes at most down well driven (by me) country roads. As I said above I have driven the route down many times and this time as well, everything went without problems. As I was setting up the station around 0615 UTC almost an hour earlier than I had alerted (always better to be early rather than late!) – just as I finished setting up the antenna and station on my usual bench with all required cables, fuses and connectors in place, I saw an alert for Mike 2E0YYY/P on GW/NW-070 Great Orme and so this first contact was also an S2S contact, so I did get one point for my outing. Despite listening specifically for VK/ZL on several occasions, none were to be had. Mike also was unsuccessful, however his attempt was hindered by high winds meaning he had to set up down the hill a little to get some protection from the winds which would also affect his antenna. Although I made no VK/ZL contacts, as you can see from the log below, I made plenty of contacts around Europe and that with a limited transmission “punch” as I realised after the activation that the, in microphone, RF-Speech-Clipper had been turned off and this does make a difference. Generally an apparent S-point over having no compression. I have switched that switch back on already for next time. Checking with Ernie and John afterwards they heard neither me nor Mike on the band. It appears we were just one day late as there had been VK-EU QSOs on 7MHz the day before. Ramsey HF amplified (30w on 40m). The VK contacts were not to be, but I still think they are possible and will try again. as we have now passed the equinox and are moving into Autumn, radio conditions will change – hopefully for the better. DD5LP/P – October 21st. 2017 VK-EU S2S event – DL/AM-001 Peissenberg. The now becoming annual, VK/ZL/JA – EU/UK S2S event, was set for this date a couple of months ago before we could know how either weather or radio conditions would be. My initial plan was to make this interesting for chasers by activating DM/BW-002 Proeller in the Bavarian Forest region. As this can be a 3 hour drive from where I live there was no way that I could get there in time for the long path, Grey line window So my plan was to travel over on Friday afternoon and stay overnight in the “Gasthaus Hochproeller” that sits about 100 vertical metres below the summit and then walk up in about 30 minutes to the summit on Saturday morning. Unfortunately the week before this activation, I wasn’t feeling so great and then I got the predicted weather forecast for the summit – rain and gusty winds of up to 53 Km/h were expected exactly at the time I would be trying to activate. So I had to make the decision to either cancel completely, as some other stations did based on the weather across Europe, or to head for a closer summit with some protection from the winds. I decided to take the latter option and to head to a summit that I know very well – Peissenberg. As well as only being 45 minutes drive from home it is a “drive’on”summit. The the car park is located on the summit from where I have a 5 minute walk to the seating banks near the Church, where I always set-up. After my tests with new antennas over the last few activations, I decided to go with my known configuration of my FT-817, home-modified 25w amplifier, the SOTABeams band-hopper linked dipole and my short 6 metre portable squid pole. Given the ease of access to the site, I considered taking my ICOM IC-7300 rig but given the likelihood of rain, I decided against that. As mentioned above Peissenberg is an easy access summit about 45 minutes drive from home. It is the location of the local TV transmitter and also the local 10 metre amateur radio beacon. There is a good restaurant on the summit along with a large church. The complete name of the location is HohenPeissenberg and is well signposted. I have activated from this summit many times before and indeed made contacts into Australia from here. The drive down was in rain until I got to about 10 Km from the summit where the roads where dry as they had not got any rain (yet). After setting up the station, the wind increased and the rain started. Luckily it only lasted 10 minutes. It stayed cold though for the whole of the 2 hour activation. To start with only a few stations were on the 20m band and several of those were too close for me to hear because of skip distance. Later with standard Nets, the scouts JOTA event and the number of SOTA activators out, the usual frequencies on the band became very busy. I heard Andrew VK1AD/2 just above the noise level – whether I could have worked him, I’m not sure but I didn’t get the chance as another European SOTA activator started working stations on the same frequency! At one point I had S5 QRN and it sounded like a storm was heading my way but luckily that never arrived. A couple more points on the SFI and a point or 2 less on the K index (although that wasn’t that bad at about 3 I think) may have made some VK/ZL portable stations workable for me. Perhaps a better antenna (one with some gain) could have made some difference? I don’t think anything would have been different if I had taken my IC-7300 to the summit given that I was getting 5-9+ reports towards the end of the activation with my 817 and 25w amp (which had 0% charge in its battery when I went QRT – lucky timing!). As we all know – “it’s all about the radio conditions” and they were not with us today. DD5LP/P – October 22nd 2016 DL/AM-001 Pießenberg for VK-EU SOTA S2S event. October 22nd. 2016 will see an increase in Summits on the Air activity between Europe and Australasia. As has been the case for the last few years, a special event is being organised by Andrew VK1AD and Mike 2E0YYY to coincide with the improving radio propagation conditions. 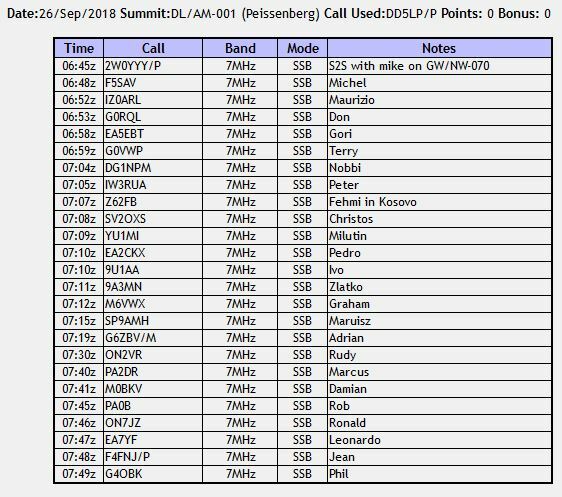 This “S2S” (Summit to Summit) ‘all mode’ CW, SSB, Data, and even FM, event already has commitments from VK, ZL, G, GM, DL, and OE stations with other European stations expected to join in the climb to the top of mountains in each region. 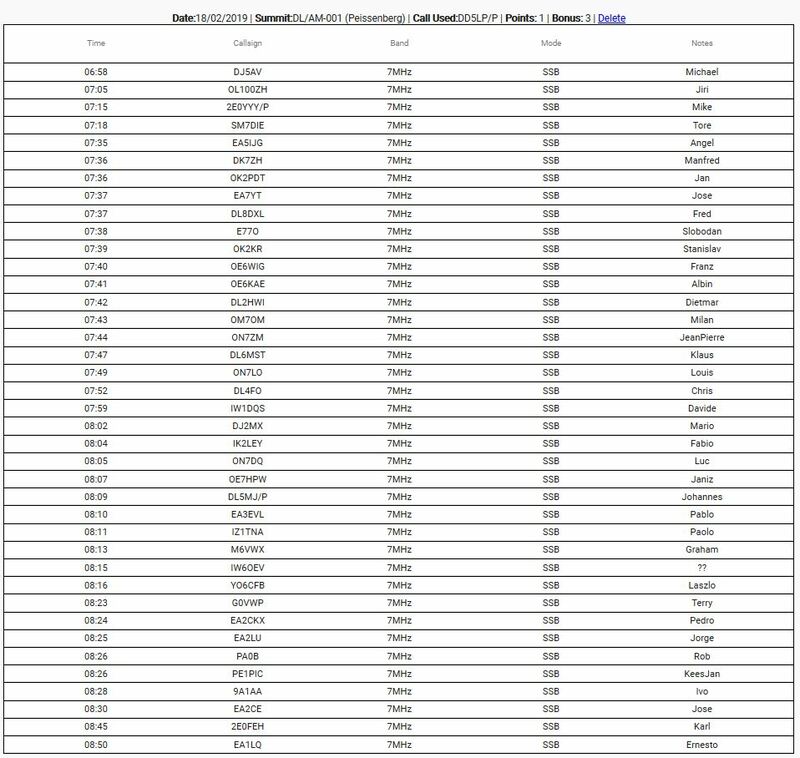 These “activators” aim to make as many “S2S” contacts as possible with other hams on SOTA summits in Europe and Australasia. The timing will be from 06:30 UTC for about two hours and is planned to coincide with long path propagation between Europe and “down under.” Around the same time, short path communications between Europe and North America is often possible. So if some SOTA activators in North America could listen out from a SOTA summit, this activity has the chance to create a World-Wide Summit to Summit event this year. Most stations will be running low power with simple omni-directional antennas, so this event also aims to show just what can be achieved with limited equipment from a location with a low noise floor. Although I had originally planned to use my new EFHW vertical on the 10m mast, at the last minute I decided it was better to go with the tried and tested linked dipole as risk the antenna collapsing on me again. I need to build some more confidence in the new antenna/mast before it can be used reliably. In fact I plan to create a lightweight version of the antenna using RG-174 co-ax in place of the RG-58 reducing its weight considerably. Equipment would therefore be the 817, the 20W amplifier, the 6m mast and the linked dipole antenna. Pießenberg is about 45 minutes drive from where I live and a drive-up summit, making an early start as required for the long path propagation to VK a possible option. There is plenty of parking and a short walk to seating at the far end of the path around the church with railings to attach the mast to. As I have already activated this summit twice this year, I would not get any activator points for this extra activation but it is the most practical for an early morning activation and my S2S points are fast approaching 1000 – perhaps I could break the magic number on this outing? (the answer was NO – not quite). The trip down to Pießenberg almost was a problem with a major accident closing the main road between Pießenberg and Hohen Pießsenberg where I needed to go. Luckily I was approaching on the back roads and when I was stopped by a young fire brigade officer he said I was fine to get through the village as far as the road up to the summit and take it up to the church. While setting up, in the dark, I found a broken link connector on the linked dipole, which would not affect 20 metre operation but would stop me from being able to move to 40m to catch local summits, and what I thought was a broken bongo-strap (turned out it was ok when I could see it in the light later). I was set-up and started operation at 0530 UTC (too early – also too dark and too cold!). I was happy with one good contact with Jason ZL3JAS in Christchurch at 06:31 UTC. While tuning the band I heard his 5-9 signal, called him and he came back to me, giving me a report of between 4-4 and 5-5 – considering I was running 20 watts to a dipole and he was running 1KW to a cobweb antenna, I’m happy with that report. It seems that the grey line long path window at the moment from ZL to DL is around 0630 UTC. I also bagged 5 x S2S contacts within Continental Europe summits but could not hear the UK activators on 20m. It was very annoying to find that whichever frequency a VK activator was spotted as being on had either a Russian or Italian 2KW+ station chatting to his mates – how do they manage this? Probably the same way as the Italian and Russian stations would come up on my (checked free before calling) CQ frequency meaning I was constantly having to move. I found out later that my signal was getting through the VK2 but I was not hearing the reply because of this QRM – that’s annoying. By 0715 UTC I was hearing less on the band and the battery in my amplifier had run flat so I packed up at 07:40. Later I heard that VK6 was coming through at around 0800 UTC but without the amplifier, I suspect my signal would not have made the trip. I also had a family trip I had to be back for. I’m kicking myself for forgetting the spare battery for the amplifier and for having two conflicting requirements on the same day, but I couldn’t do much about the latter. Summits on the air Summit to summit international event 22nd. October 2016. October 22nd saw the Summits On The Air, Australia to Europe Summit to Summit event. Fifty one summits across Europe, Australia, New Zealand and Japan were registered by their activators as intending to take part in this 2 hour “super-activation”. When 0630 UTC arrived with weather varying from freezing cold to pouring with rain in Europe and not a lot better in Australia, the SOTA activators started their calls. Between 6:30 and 8:30 UTC seventy three summits were activated – twenty two more than expected. Mother nature and propagation were “variable” to say the least but contacts were made between continents as well as within each of the regions. At times the number of active summits made it difficult to find a free frequency on 20 metres to call CQ on. Thanks to Gerard VK2IO for the following audio clip of my signal making it through the “ether” from Southern Bavaria to New South Wales Australia. Unfortunately no contact was made due to QRM from QRO stations in Europe who often started up transmissions on top of the QRP SOTA stations. The organisers Andrew VK1AD and Mike 2E0YYY declared the event a success and planning is under way for future Australia to Europe SOTA events, most likely twice a year around the dates that we change the clocks in Spring and Autumn. A similar event is being discussed between European and North American activators. Once details are confirmed, you’ll here about it here on ARNewsline. In the meantime checkout sota.org.uk to find out about Summits on the Air. For AR Newsline this has been Ed Durrant DD5LP from Bavaria in Southern Germany. 6 metre “lambdahalbe” fibreglass mast. I was on site FAR too early, it was cold (but thankfully there was no rain), dark – I almost needed a torch to set-up but managed without and because I started so early I ran my rig’s (and more importantly, the amp’s) battery down. Rather than risk the newly built vertical, I decided to go with the tried and tested linked dipole. On putting it up I found one of the link connectors had broken off the wire – not an issue for 20m but this meant I couldn’t switch to 40m to pick up EU S2S contacts. I forgot to take the spare battery for the amplifier. In fact when I saw the amp was no longer turning on, the Internal LIPO had hit zero percent on all 4 cells. Later I managed to recharge the battery and it “seems” no worse for wear. Time will tell. Normally I avoid taking LIPOs below 25% charge. Timing – not only was I set up too early, I also shut down too soon (partially due to the amp battery but also as I needed to get home for a family outing). If I had stayed another 30 minutes, I might have bagged John VK6NU in WA. Even with these errors I managed 5 x S2S contacts but only within Europe. I’m rather proud however that I managed a good contact with Jason ZL3JAS in Christchurch. What I found REALLY annoying was the fact that I was not able to even listen for spotted VK & ZL SOTA activators as in EVERY case when I went to the spotted frequency a local high powered Russian or Italian station was chatting away to his friend down the road on exactly the frequency the DX SOTA station was spotted on. I also had to move several times when calling CQ when an EU QRO station simply decided they would use the frequency to natter on, without first checking it was free!